How can we help financial institutions to invest at the lowest cost to meet the challenge of compliance, risk management and finance operations in a fast-moving world? On the one hand, banks face an increased demand for developments due to regulations evolutions. On the other hand, since budgets are decreasing, they have fewer resources to meet these requirements, which means they must “do more with less”. Today, investing in compliance is a necessity. Organizations must have auditing capabilities needed to justify executed client transactions. 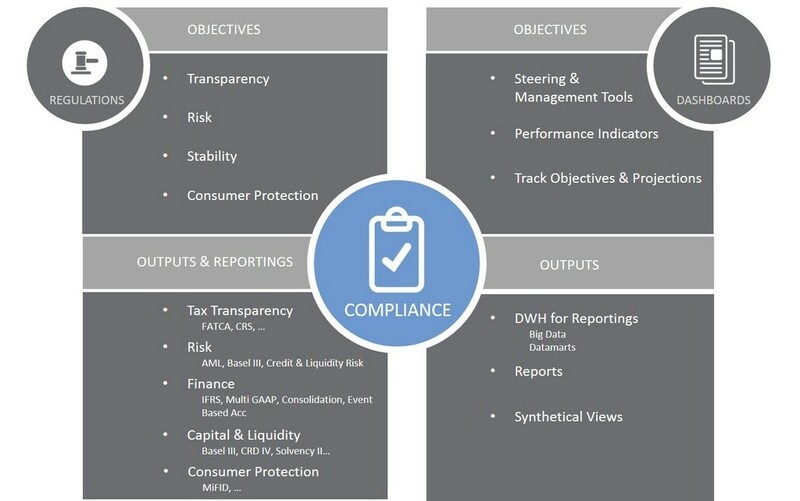 There are different ways to approach the compliance and risk management. MAINSYS accompanies banks in this challenge with a comprehensive range of solutions that includes new productivity tools for the internal teams. MAINSYS also provides the expertise to support the banks’ operations with GFRC (Governance, Finance, Risk & Compliance) systems such as the Wolters Kluwer Financial Services OneSumX solution.